There's plenty to like about these reasonably priced Bluetooth earphones. Most athletic earphones work fine for everyday tasks, but everyday earphones usually aren’t suited to athletics. Working out or playing sports takes a heavy toll on them. Moisture from rain, mud, or sweat can fry their delicate electronics. Even cleaning them can be risky after sweaty workouts if they’re not water-resistant. For that matter, everyday earbuds usually aren’t designed to handle the vibration and jostling inflicted on them by joggers. Bose’s SoundSport Wireless Bluetooth Headphones are designed to tackle those athletic challenges and they handle themselves well. They’re resistant to the elements, they stay secure in your ears, and I even like their sound. Unfortunately, a handful of minor flaws hinder their potential. Much like Bose’s excellent SoundSport Free true wireless earphones, the battery and the bulk of the electronics are stuffed in pods inside the endcaps of each earbud. This design comes with a number of pros and cons. On the plus side, having all these guts packed into the pods rather than inline on the pods’ connective cable means that they feel balanced and don’t bounce around when I’m exercising. This also eliminates much of the microphonics I come across while testing other in-ear headphones. On the downside, this design makes the pods noticeably larger and heavier than what you’ll see from most competing Bluetooth earbuds. If your fashion sensibility leans toward clean-lined minimalism, these earbuds aren’t for you. And with colors like that, Bose is going to make sure people see you wearing them. Bose compensates for the potential discomfort of that heft and weight with its incredibly comfortable StayHear+ ear tips. The tips are made from a single piece of silicone and come in three sizes, and they’re designed to ride loosely on the ear’s auricle, just outside of the auditory canal. Since they’re not tightly squeezed into the ear canal, though, they only serve up a small degree of passive noise cancellation. You wouldn’t want them if you’re seeking a sublime auditory experience, in other words, but their ability to allow outside noise while channeling the sound from your audio source allows for increased situational awareness. This makes them wonderful for gym-goers, joggers, or cyclists. 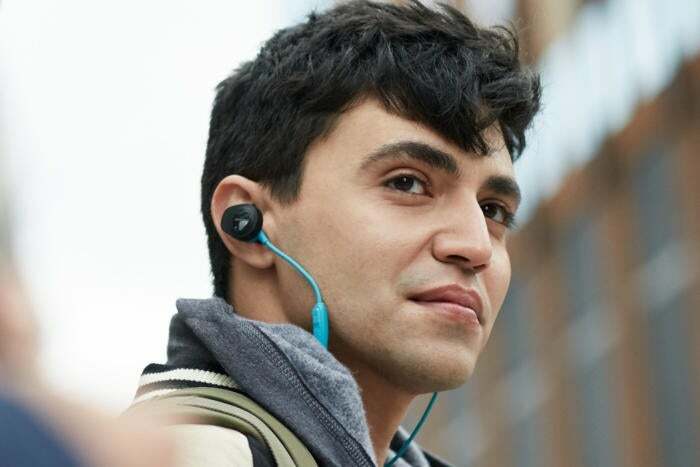 As we’ve come to expect from Bose’s other in-ear products, the headset’s volume, multi-function button, and microphone are baked into a lightweight in-line pod that hangs about an inch and a half below the right ear. The microphones in the pod provided clear call quality, and people I chatted with on the phone and through Skype said the mic provided decent audio voice quality while limiting environmental noise. 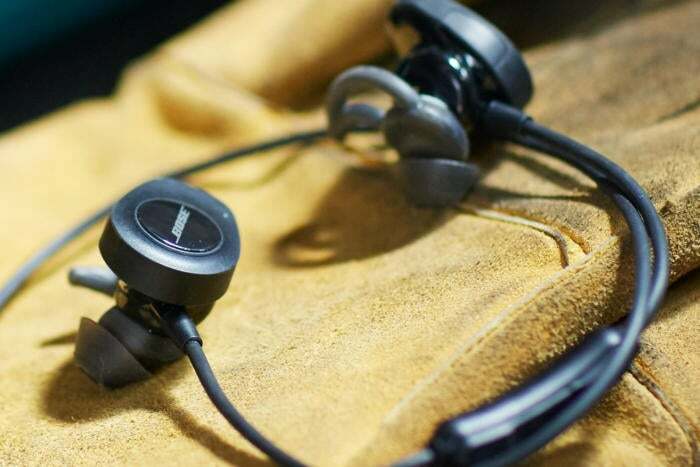 These headphones also have an IPX rating of 4, which means they can handle a bit of rain or sweat, but you wouldn’t want to throw them in the pool. If you finding yourself having to hose down both yourself and your gear after a workout, you should consider Jaybird’s completely waterproof X4 earphones instead. 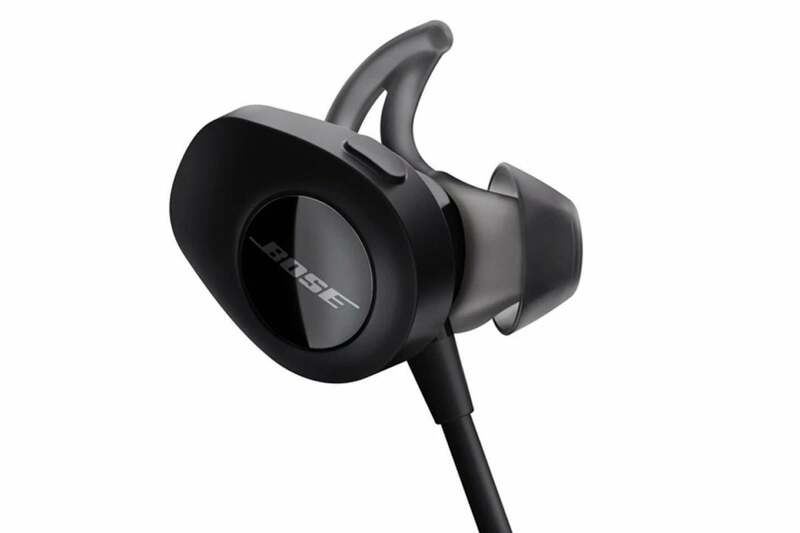 As for battery life, Bose says the earbuds should deliver around six hours between charges. Based on my testing, this is accurate. That said, keep in mind that the volume affects the runtime, and that they’ll require two hours of charging via a USB power source once they’re depleted. And here’s a small surprise: they also feature Tile’s tracking technology. If you’ve got the Tile app downloaded on your iPhone, you can make the SoundSport Wireless headphones edit a loud chime that should help you find them—provided you’re within 30 feet of them. The SoundSport wireless headphones can connect to two audio sources simultaneously, so you can listen to a movie on an iPad and take calls from your iPhone with the same device. The SoundSports are smart about it, too, as they’ll pause the audio on your iPad while you take the call and start it again once you hang up. If you’re a one-device-at-a-time sort of person, the free Bose Connect app makes switching between audio sources a cinch. I found the Bluetooth connectivity with these earbuds to be pretty solid up to distances of 25 to 30 feet away. I did experience occasional hiccups in Bluetooth connectivity, but they were few and far between. The small volume control panel is a welcome alternative to the bulky slab you often see on connecting wires on other Bluetooth headphones. Bose’s speakers, headphones, and earphones are known for their detailed, neutral sound. That’s mostly what you’ll get with the SoundSport Wireless. That said, I did notice that the bass they provide is more forward than other Bose products I’ve used in the past. With a set of sports earbuds, that’s a good thing: Having a little extra thump to keep the beat as you power through the last few minutes of a workout or run is always a win. Despite the extra bass, I found they offered more than enough treble to allow nuances to stand out regardless of what I was listening to, making them a fine choice for those with an eclectic taste in music. As a reminder, though, Bose intentionally designed these earbuds to allow for a bit of ambient noise, so you might find yourself listening to music at higher volumes than normal in order to enjoy every note of your favorite recordings. While they may feel a little heavy and aren’t completely waterproof, there’s plenty to like about the Bose SoundSport wireless headphones. With their enjoyable sound, great situational awareness, and Tile tracking capabilities, they’ve got what it takes to be an athlete’s favorite workout buddy. 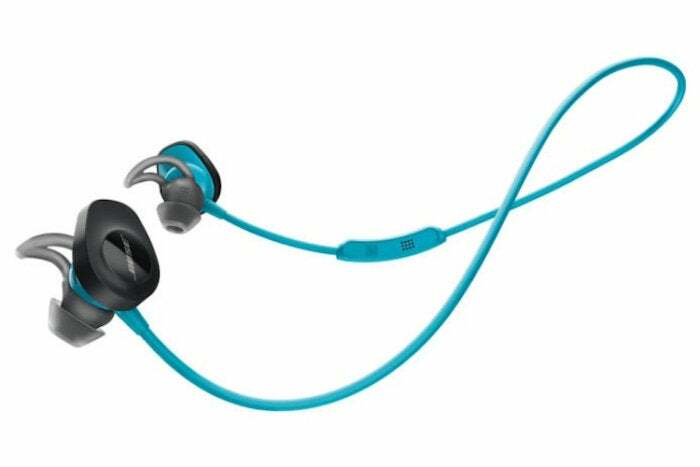 This story, "Bose SoundSport Wireless Bluetooth Headphones review: These durable earbuds are an athlete's friend" was originally published by Macworld.